It had rained the whole day in Whangarei. While I still wanted to explore the undeveloped Abbey Cave system, Barret was worried about flooding. And lights. And proper clothes. “Do you think Bear Grylls would be worried?” Perhaps I was taunting him too much. Abbey Caves are three separate tunnels hidden within a hilly landscape and connected by a circular footpath. The first tunnel, Organ Cave, was a gaping black hole in the side of a hill. A small stream of cold water filtered through the boulders piled at the foot of the entrance. It looked intimidating and at first we weren’t even sure if it was one of the caves. The dark completely enveloped us a few steps beyond the threshold. Barret’s small flashlight illuminated just enough to let us know we were shin deep in murky water. Just as it began to feel oppressive and creepy, we entered a small cavern. The ceiling was lit up like a night sky- except instead of white dots, they were sapphire blue and hungry. 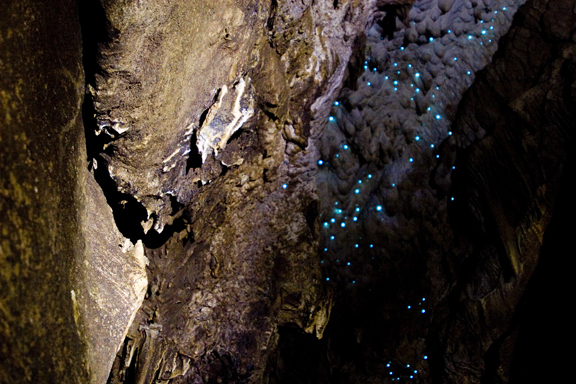 Glow worms are really larvae that capture their prey with a sticky and luminescent filament. The brighter they glow, the hungrier they are. As they burned away in hopes of a good meal, Barret and I cuddled underneath, completely enchanted. Sure Bear Grylls would have gone on a rainy day, but he would have been alone. 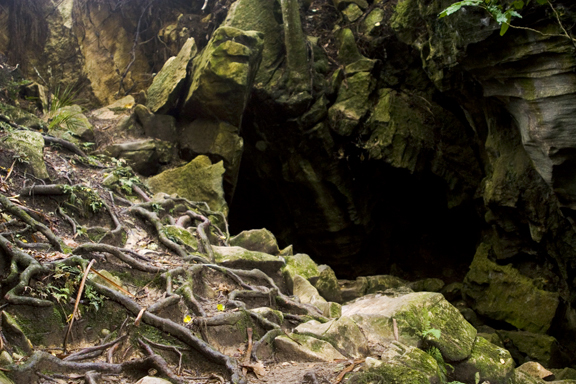 How to get to Abbey Caves: Abbey Caves Road, Whangarei. There is parking on the side of the road, across from the Little Earth Lodge. More please!!! This is the stuff of fantasy.